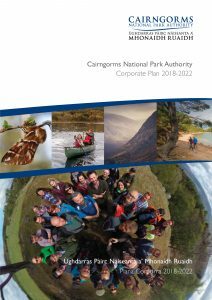 The Cairngorms National Park Authority has a duty to produce a Corporate Plan every three years. The shared vision for the Cairngorms National Park is set out in the Cairngorms National Park Partnership Plan 2017-2022. It has been our job to lead the preparation of this Plan, and its vision. It is now our job to monitor and coordinate its delivery by all the partners involved, as well as to make our own contribution to delivering elements of it. The CNPA Corporate Plan 2018-2022 sets out how the we intend to do that, using our grant-in-aid from the Scottish Government. The Corporate Plan covers the four years 2018-2022. In each of these years we will also prepare an Operational Plan setting out more detail of our activities in that particular year, and publish an Annual Review on what we have done at the end of each year. You can also view our previous Corporate Plan 2015-2018.